Urbana’s Makenna Radford (4) goes around Riverside’s Shelby Giles on the baseline during Monday’s game at UHS. 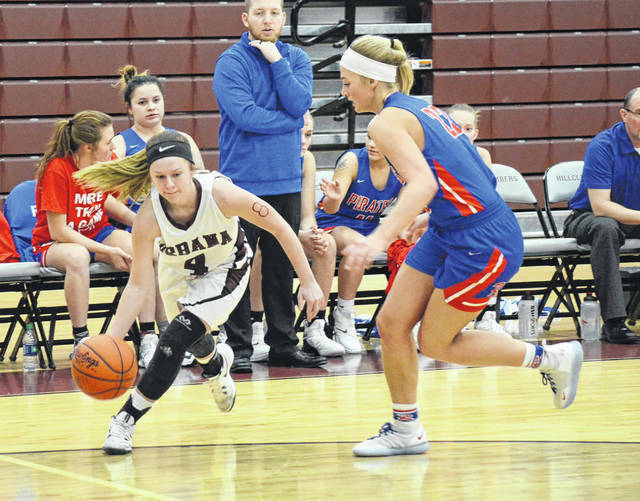 Urbana defeated visiting Riverside, 43-37, in non-league girls basketball on Monday. The ’Climbers hung tough early but stumbled to a small deficit on the scoreboard thanks to a big one on the glass. Offensive rebounds for the Pirates led to second-chance points and haunted the ’Climbers. It was 18-16 Riverside at the half. Alaina Lyons provided most of the Hillclimbers’ offense, knocking down a trio of bombs and a transition jumper in the first half. She finished with 11 points. The second half went a little smoother for Urbana, with the girls fighting for rebounds and actually claiming an edge on the boards. Kacie Martin hit a jumper with 10 seconds left in the third quarter to give Urbana the lead at 23-22. In the fourth, Riverside jumped out to a two-possession lead midway through, but the ’Climbers fought back and took a lead that forced the Pirates into a press with a couple of minutes remaining. The rest of the work was done at the free-throw line against an over-zealous Riverside defense. Urbana was 12-of-18 from the stripe. Marissa Horn finished with 10 points and Shelby Stoops had 8 for UHS. Eight of Horn’s 10 and seven of Stoops’ 8 came in the fourth-quarter run that put the game away. Urbana (3-14) hosts Northwestern on Wednesday. https://www.urbanacitizen.com/wp-content/uploads/sites/36/2019/01/web1_MakennaRadford012819_ne2019128183430632.jpgUrbana’s Makenna Radford (4) goes around Riverside’s Shelby Giles on the baseline during Monday’s game at UHS.